Laialdane sensori valik teeb sellest ühe turu mitmekülgsema mõõteriista. 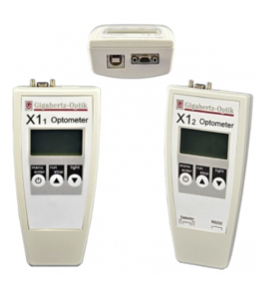 The X11 (Xone-one) and X12 (Xone-two) optometers are two of the most versatile hand-held light measurement instruments available. They combine a powerful electronic design packaged in a light-weight ergonomic housing. Their compact size makes them ideal for field service applications. A unique feature of the X1’s is their capability to operate detector heads housing up to four photodiodes with all four signals displayed on the four line display with on/off backlighting. When more than one detector head is used simple and faultless selection of the calibration data is accomplished using the X1’s menu mode. Operating the X1 is simple. The meter set-up is supported by an easy to use menu. The menu allows selection of the operating mode, the detector and measurement parameter. Once set-up all settings are stored and recalled on next power-up unless reinitialized. Measurement values are displayed in absolute quantities for the particular detector connected. For on-site applications the X1’s are operated with two standard 1.5 V AA batteries. In remote control operation the X11 is powered through the USB interface. The unique feature of all X1’s is their capability to operate multi-cell detector heads with up to four photodiodes with all four signals displayed or read-out via the USB or RS232 interfaces. The X11 and X12 only differ in their interfaces. The X11 features a USB interfaces, whereas the X12 features a RS232 interface.